This chapter discusses echocardiographic subtleties of right heart disease. A detailed examination of the right ventricle (RV), right atrium (RA), tricuspid valve (TV), pulmonic valve (PV) and pulmonary artery (PA) is required to diagnose some important diseases. To achieve best patient outcomes, some of these diseases need to be diagnosed early, when findings are subtle. 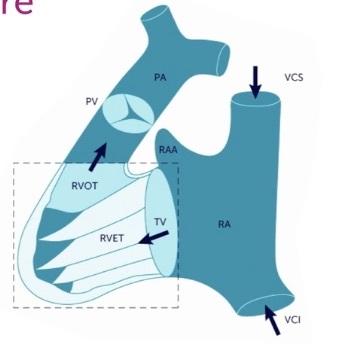 Here is a schematic image that shows the complicated shape of the RV, which reminded early anatomists of a bagpipe; the inflow region and apex are the bag and the right ventricular outflow tract (RVOT) is the pipe going to the PV (mouth). No single view can image all regions of the RV. Earlier chapters discussed views that imaged parts of the right heart. Here is some additional information about these views. PLAX: A standard PLAX is optimized for the left heart and has only an oblique cut through the RVOT. IMBUS focuses on the shape of the PLAX RVOT as a clue to disease but there is a reported normal range of 2.0 - 3.0 cm for the diameter in this view. Unfortunately, the variability of the oblique cut in this view means that diameters can be over-estimated and need confirmation in other views. PSAX: As previously discussed, an IMBUS exam should routinely angle a PSAX modestly toward a patient’s right shoulder so that some of the RA, TV, and inflow part of the RV can be seen. An IMBUS advanced physician should also fan further anterior of the aorta to see the proximal RVOT. The diameter is taken perpendicular to the lumen and has a normal range of 2.1 - 3.5 cm. Here is a normal view. The probe should also be angled a little further toward the patient’s left to see the distal RVOT, PV, and main PA to the right of the aorta on the screen. Color can be applied to the PV but the view is only partly parallel to flow. The distal RVOT has a normal diameter of 1.7 - 2.7 cm. Here is a normal view. The PA diameter can be measured in this angled PSAX just distal to the PV, with normal being 1.5 - 2.7 cm. The PA should be smaller than a normal aorta. An enlarged PA indicates substantial chronic pulmonary hypertension or chronic volume overload from a left to right shunt. Here is a normal PV and PA in an angled PSAX. 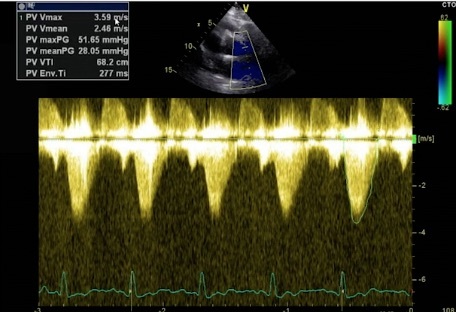 Apical4: Both the basal-RVEDD and mid-RVEDD can be measured in the apical4, but endocardial definition may be suboptimal because the ultrasound beam is mostly parallel so the chamber diameter can be measured falsely high. The mid-RVEDD is more commonly used with a normal range of 1.9 - 3.5 cm. The normal basal-RVEDD is wider at 2.5 - 4.1 cm because a normal RV is a bit triangular in this view. Here is a normal apical4 with basal- and mid-RVEDD measurements. Subcostal4: This can be an excellent view for measuring the basal- and mid-RVEDD because the ultrasound beam is more perpendicular to the walls. The lateral RV wall diameter (≤ 0.6 cm) is also best measured in this view but requires an optimized image for accuracy. A normal RV lateral wall is eyeballed by noting that it is less than half as wide as a normal IVS. Here is a normal subcostal4 optimized for the lateral RV wall measurement. Don’t include the pericardium, papillary muscle, or chordae in the measurement. IMBUS uses three special views for the right side of the heart. Parasternal long axis right (PLAXR): Some experts think this should be routinely performed because it can be excellent for the TV and part of the RA. Start with a PLAX and fan the probe caudad. On the screen, the inflow part of the RV is above, the anterior and posterior leaflets of the TV are in the middle, and part of the RA is below. The view across the TV is not parallel to flow but Color can be applied. The coronary sinus and IVC can sometimes be seen entering the RA at the lower left of the RA on the screen. The following clip shows a normal PLAXR with the coronary sinus (left) and the IVC (right) entering the posterior RA. Apical3 right (AP3R): This view is usually called the RV Inflow/outflow view, but it seems easier for the IMBUS physician to think of this as an apical3 of the right heart. Start with an apical4 and slide the probe more over the right heart. Rotate 90 degrees counterclockwise (indicator down to the table). The RV is above the RA on the screen. The RVOT is the “third chamber” heading off to the right. Here is a normal AP3R. Subcostal PA (SCPA): Even if the PLAXPA or angled PSAX gave good views of the PV and PA, the angle was not parallel to flow across the PV so Color and continuous wave Doppler analysis could not be optimal. The SCPA is better for Doppler analysis because it is more parallel to PV flow. Start with a subcostal4 and rotate 90 degrees clockwise to the subcostal short axis (SCSAX). Optimize the view and fan/slide the probe away from the apex and toward the aorta. The distal RVOT, PV, and PA come into view before the aorta. Here is a normal SCPA. This is a key finding in right heart disease. Eyeballing may easily identify generalized RV dilation, but some diseases of the right heart are more focal so measurement at the following four locations may be needed (normal ranges shown). Body height must be considered when interpreting a patient’s measurements. There isn’t a routinely published range for the RV apex diameter, but it should be smaller than the mid-RVEDD. The length of the RV was traditionally measured, but it doesn’t add much so won’t be an IMBUS tool. Here are the diagnostic considerations for RV dilation. The RV does not compensate well for elevated afterload, so untreated patients with substantial PAH have short survival. Idiopathic PAH is optimally diagnosed in asymptomatic patients who can be treated “early and hard” with multiple drugs before advanced RV dilation and dysfunction have occurred. Echocardiography can’t directly measure PA systolic pressure, but the peak systolic TV gradient indirectly reflects this pressure. Remember that severe PAH does not always produce moderate or severe TR, so even mild TR should have the gradient measured. Chronic, substantial PAH eventually causes diffuse RV hypertrophy and dilation. In the later stages of disease, increased systolic IVS flattening/D-ing toward the LV develops and the LV becomes smaller with a decrease in cardiac output. Because mild or moderate pericardial effusions are frequent in advanced PAH, pericardial tamponade is sometimes considered, but the prominent RV hypertrophy and dilation with a high TV gradient should strongly favor PAH. When the RA pressure exceeds LA pressure, hypoxia can develop if blood can shunt right to left through a patent foramen ovale. The formal catheterization lab cutoff for diagnosing PAH was recently lowered to a mean pulmonary artery pressure > 20 mmHg. This reduction from the previous 25 mmHg was justified by recent major improvements in early PAH treatment. An IMBUS physician should be concerned about PAH when the peak systolic TV gradient is greater than 27 mmHg, particularly in non-elderly patients. Peak gradients between 22-27 mmHg are still abnormal but can be followed periodically to watch for a rise in the gradient. Remember to exclude pulmonic stenosis (PS) with Color and continuous wave Doppler in any patient with an elevated TV gradient (see the Carcinoid section at the end of this chapter). When PS is excluded, elevated TV gradient patients should go through the following diagnostic process. Step 1: The first diagnostic step for elevated TV gradient is searching for post-capillary disease. Much of this can be done in an IMBUS clinic, but formal echocardiography, cardiology consultation, and a right heart catheterization may be needed. Post-capillary PAH is caused by some disease of the left heart that chronically elevates left atrial, then pulmonary venous, and finally pulmonary arterial pressures. In the traditional 5-group classification of PAH, this is Group 2. The diseases may be LV systolic dysfunction, LV diastolic dysfunction, Valve disease (mitral more common than aortic), Arrhythmias, and infrequently Pacemaker troubles. Fixing the left heart can reduce the PAH. Echocardiography may easily identify the culprit left heart disease, but the definitive test in confusing cases is the pulmonary artery wedge pressure during right heart catheterization. A wedge pressure substantially < 15 mmHg excludes post-capillary PAH. Pre-capillary PAH is the working diagnosis when an elevated TV gradient is not caused by PS or left heart disease. The following differential diagnosis needs consideration. Group 1: Idiopathic PAH (the disease with important, new treatments), Heritable (rare), Drugs/toxins (mostly amphetamines and anorexants), Connective tissue diseases (e.g. systemic sclerosis), HIV, Portal hypertension, Schistosomiasis, and Pulmonary veno-occlusive disease (rare and should have a diffuse interstitial pattern with pulmonary IMBUS). Group 3: Pulmonary disease (including sustained hypoxemia) is a small group because COPD hardly ever causes substantial PAH. The more rare interstitial pulmonary diseases can be a cause and should produce a diffuse interstitial pattern with pulmonary IMBUS. Severe sleep disordered breathing with sustained hypoxia may need to be considered with some patient risk factors. Group 4: Chronic thromboembolic pulmonary hypertension (CTEPH) is a very important group that is more common than either groups 1 or 3 and has specific, effective interventional treatment. This is discussed in more detail below. Group 5: A tiny, multifactorial grab bag for poorly understood patients. STEP 2 WHEN PRE-CAPILLARY PAH IS THE WORKING DIAGNOSIS: A patient’s history, pulmonary IMBUS exam, and perhaps a sleep study will eliminate most patients in Groups 3 and 1, except for idiopathic PAH. The major task with presumed pre-capillary PAH, before diagnosing idiopathic PAH, is exclusion of CTEPH. There are several different types of CT scans that can help with this determination and a direct discussion with radiology may be needed to choose the correct exam, but cardiology will be involved by this point. Occasionally, invasive pulmonary angiography is necessary. Before discussing CTEPH, here is a quick review of echocardiography in acute PE. A PE needs to acutely obstruct at least 20-30% of the pulmonary vascular bed to cause hemodynamic compromise, so most patients with PE have normal right heart echocardiography. When an acute PE is large enough, the afterload on the RV increases and a previously normal RV quickly dilates and declines in function. TR can result and the peak gradient may be elevated, but not > 60 mmHg because a non-hypertrophied RV cannot acutely develop higher pressures no matter how severe the obstruction. Systolic flattening/D-ing of the IVS can occur. When the apical RV function is more preserved than the mid- and basal RV function a McConnell sign is identified. While this sign is not very sensitive and not completely specific, it is still an important clue. Here is an example of a McConnell sign that shows the apex just winking in. The next image is from one of our hospital patients with a massive PE. Although the image quality is worse, there is a more full view of the RV that makes it easier to see the discrepancy between the radial function at the base and mid-RV compared to the apex. The echocardiographic differential diagnosis for PE includes patients with pre-existing but undiagnosed RV disease, so careful assessment of all aspects of the right heart is important. Some patients with an ischemic RV infarct (right coronary artery) can resemble a PE. Severe pneumonia was described as an echocardiographic mimic of acute PE, but pulmonary IMBUS should detect such severe pneumonias. CTEPH occurs as a late complication of acute PE in a small percentage of patients. The echocardiographic appearance of CTEPH and idiopathic PAH is the same. The mechanism is unclear but may include recurrent PE and perhaps genetic susceptibility that leads to poor clot lysis or over-aggressive vessel wall remodeling. Since CTEPH is sometimes diagnosed in patients without a previous diagnosis of PE, the assumption is that some patients with acute PE don’t seek medical attention or are misdiagnosed initially. A patient in an IMBUS clinic with a recent PE should have several screens for PAH during the first several years because CTEPH needs to be diagnosed before RV dilation and dysfunction have developed. Patients with CTEPH can be dramatically helped and even cured with the use of balloon angioplasty and/or surgical thromboendarterectomy so they need to be cared for in a center that regularly performs these procedures. CTEPH patients are the only PAH patients that should be anticoagulated. The treatment of this disease is pharmacologic and complicated but has markedly improved function and survival of these patients. There are at least three different mechanisms that can be attacked with current medications and drugs for other targets are in development. Experts favor “early and hard” treatment with several medications even in minimally symptomatic patients. The RV compensates acceptably well for volume overload for many years. The RV dilates but doesn’t hypertrophy. However, the RV may become irreversibly dysfunctional and then the prognosis is much worse. The major lesions causing RV volume overload are TR, PR, and left to right shunts. The RV in these patients has good function until late in the disease and may even appear hyperdynamic. Septal flattening or D-ing of the IVS in diastole is characteristic later in the disease and the elevated RA pressure will be reflected in the internal jugular vein and IVC. TR is common, and many normal adults have trace TR which should be ignored. However, more substantial TR needs to be watched carefully because the disease can be progressive, regardless of the cause. The RV volume overload from the TR exacerbates RV dilation, worsening the TR in a vicious cycle. Functional TR, which should have a central jet, occurs when the RV, or even just the RA, dilates. For example, chronic atrial fibrillation causes biatrial dilation and this dilation alone can result in functional TR or MR. With RA dilation, or basal RV dilation, the TV annulus is stretched, moving the leaflets apart and producing a coaptation defect. If the RV dilation involves the mid-RV, the papillary muscles are displaced, stretching the chordae and further worsening coaptation. An annuplasty ring may help functional TR, so patients with moderate or greater TR need to be followed regularly so intervention can occur before irreversible damage has occurred to the RV. Structural TR can be from Rheumatic heart disease, Blunt chest trauma, Pacemaker leads (shown in the TV chapter), Endocarditis, Carcinoid heart disease, and Congenital conditions (including Ebstein anomaly). Here is a patient with blunt chest trauma and severe TR. The PLAXR was used to show the flail anterior TV leaflet. Ebstein anomaly is a congenital defect in which the TV is displaced apically in the RV. TR can be substantial and the RV is smaller and the RA larger because it contains an “atrialized” portion of the RV. Here is an Ebstein anomaly. The most common cause of PR is PAH, but Endocarditis, Rheumatic heart disease, Congenital conditions, and Carcinoid heart disease are causes. Many normal patients have ignorable trace PR so we are only concerned with more than mild regurgitant jets. An angled PSAX (or a PLAXPA) may see the PV and Color may detect PR. However, these views are only partially parallel to flow through the valve. Here is a clinic patient with mild PR in an angled PSAX. The SCPA is important for the PV because it is more parallel to flow. The following is a SCPA of a severe PR jet. An ASD should be considered whenever a dilated, non-hypertrophied RV is seen and meaningful TR and PR have been excluded. The largest ASDs are usually diagnosed in childhood, but hemodynamically important ASDs can be asymptomatic into adulthood. ASDs that cause RV dilation always need to be fixed. The apical4 and subcostal4 are the important views and Color should be applied over the interatrial septum. The subcostal4 is more sensitive for the jets because it is more parallel to flow. With high suspicion for an interatrial shunt, keep the Color sector width narrow to preserve a high frame rate and apply Color separately to the peripheral half and then the central half of the interatrial septum. There are three types of ASD depicted in the following diagram. The sinus venosus defects and primum ASD are rare and often require TEE to define. 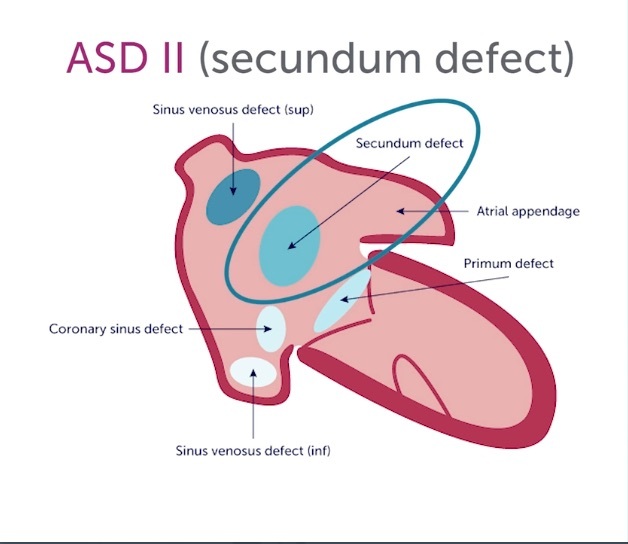 The much more common secundum ASD can be well identified with trans-thoracic echo. It occurs in the thicker, more hyperechoic central part of the interatrial septum. A patent foramen ovale occurs in the fossa ovalis, which is in the thinner, more peripheral part of the interatrial septum. Here is an apical4 with Color showing a smallish secundum ASD. Notice that the RA and RV were not particularly dilated, reflecting the small size of the shunt. Here is the B-mode apical4 from a nine-week pregnant patient found to have RBBB on her ECG. The RV was very enlarged, non-hypertrophied, and had excellent function. Her mid-RVEDD was 5.4 cm. She had mild TR with a mild TV gradient elevation, no PR, and no VSD. Here is her subcostal4 with Color showing a jet crossing the interatrial septum. An IMBUS-detected ASD will often need confirmatory formal echocardiography and bubble contrast may be ordered as part of the exam. However, the contrast study can fail to show the shunt if RA pressure is not high enough to shunt blood right to left, even with a Valsalva maneuver. TEE, perhaps with 3D imaging, is often needed for interventional therapy planning. An IMBUS study with excellent views of a prominent ASD might be handled with a cardiology phone consultation (sending our clips) that leads directly to TEE for therapy planning. With large ASDs, the PA usually dilates. Here is an angled PSAX in a patient with a large ASD and an extremely large PA.
Large shunts produce excess pulmonary arterial flow that can eventually result in PAH. The resulting rise in RV and RA pressures can balance the ASD shunt and make jets disappear. Fortunately, such large shunts are usually easy to see as holes in the interatrial septum with B-mode. Rarely, when PAH from a large shunt progresses far enough, the RA pressure can exceed the LA pressure and the shunt can reverse direction, producing hypoxia. This is Eisenmenger syndrome. CAUTION: In the subcostal4, inflow into the RA from the IVC, SVC, or even coronary sinus can be prominent and suggest an ASD or PFO if the inflow Color signal appears first at the septum. The following is a good example of inflow that initially suggested a PFO to the physician. Usually this inflow is fairly prominent, suggesting a good volume of shunt. Yet, the patient has no dilation of the RA or RV so the possibility of a substantial shunt is greatly diminished. Importantly, a PFO or ASD needs to show Color crossing the interatrial septum from the LA into the RA. The Color signal should not all be on the RA side of the interatrial septum. Respiration effects are also helpful because the great majority of PFO and ASD patients should have more prominent flow during expiration, when the LA volume and pressure are higher. This is in contrast to IVC/SVC inflow which should be more prominent with inspiration. Coronary sinus inflow probably doesn’t vary much with respiration. Prominent RA caval inflow will usually be seen in the apical4 in these patients, helping to dismiss the thought of an interatrial shunt. Acquired VSD in ischemic disease should have accompanying LV wall motion abnormalities. Congenital VSDs are less common than ASDs. The most common congenital VSD occurs in the membranous septum near the aortic valve so even the PSAX can see it, as in the following. A subcostal4 is overall best for VSD detection because the beam is more parallel to flow through the IVS. Continuous wave Doppler should be placed through the jet because high velocity is a good sign, indicating a small VSD that does not need to be closed. This is an autosomal dominant genetic disease with a major complication of arrhythmogenic sudden death, so this entity is sometimes called arrhythmogenic right ventricular dysplasia (ARVD). There is fatty and fibrous replacement of myocardium in certain parts of the RV. The ECG may have an epsilon wave in the very early ST segment. The echocardiographic features of RVD are strongly suggestive, but not diagnostic. Cardiac MR is currently the best diagnostic test, showing late enhancement in characteristic areas of the RV. The most important echocardiographic feature of RVD is focal dilation with accompanying reduced function and wall thinning. To make the diagnosis, the different parts of the RV must be seen, including the RVOT, which is often dilated, even in isolation. The apex may have decreased function and increased trabeculation. Because the basal RV may be spared, TAPSE can be normal. TR is usually present but the gradient should not be substantially increased. Here is an AP3R of an RVD patient showing that the lower RV is not dilated but the outflow tract going to the right is dilated. Here is the same patient with a SCPA showing the dilated distal RVOT. When carcinoid tumors metastasize to the liver, vasoactive substances may be released into the hepatic veins and flow directly to the right side of the heart. These substances cause endocardial fibrosis with the greatest effect on the TV and the PV. The TV lesion is almost always TR. The PV develops PS, but PR may also occur. 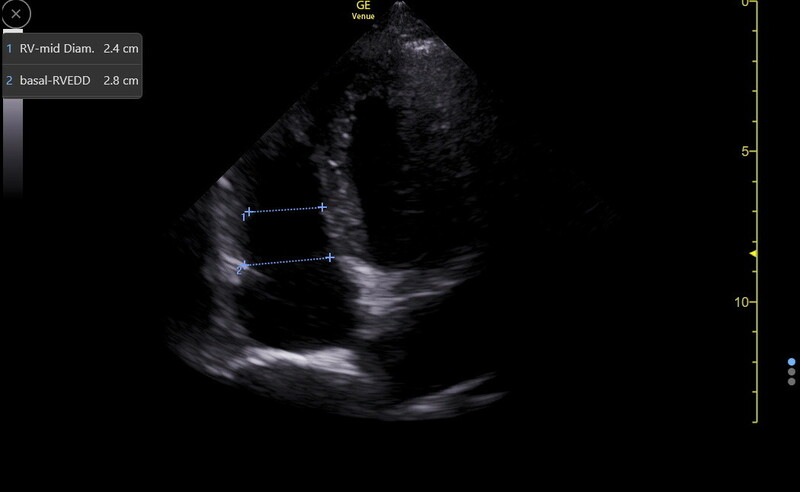 The endocardium of the RV wall can be thickened and more echogenic. The vasoactive substances are cleared in the lung so the left heart is spared. Carcinoid heart disease is the major cause of death in carcinoid syndrome. The following patient had RV dilation and moderate TR. The TV gradient measured 64 mmHg so the initial assumption was that the patient had PAH. However, when the PV was appropriately evaluated with Color and continuous wave Doppler, high velocity flow was seen through the valve. Here is the continuous wave tracing through the PV using the SCPA. The PVmax was 52 mmHg, showing that the elevated TV gradient was not caused by PAH but by PS. The details of the PV in this patient were not easy to see, but the TV was seen a little better. The leaflets of the TV were thickened, especially the tips of the leaflets. The leaflets were restricted in movement, so they coapted poorly and caused TR. Here is a different patient with carcinoid showing thickened, restricted TV leaflets. The combination of PS and TR is the hallmark of carcinoid heart disease, so the examiner in this case put the probe over the liver and saw masses and carcinoid was eventually diagnosed. The RV does poorly with the combination of TR and PS. However, if the carcinoid tumor is treatable AND RV function is still good, valve surgery on the RV and PV is possible and heart function and survival will improve.